Its cookie season and America’s Girl Scouts are frantically selling cookies by the day to masses of Thin Mint craving and Samoa coveting people allover the country. For more than 80 years, Girl Scouts have sold cookies to fund their activities and events. Selling the cookies also is fun for the scouts and they acquire valuable life skills. Enough with the history though, that’s not why we are here today. Our purpose is to dissect and analyze each of the top cookies sold by the Girl Scouts, so that you can be guided through your purchases and know which cookie really is the best. Today our final grade will be determined on three important factors: taste, size and appearance. Each will be graded on a scale of one to five, the higher the better. 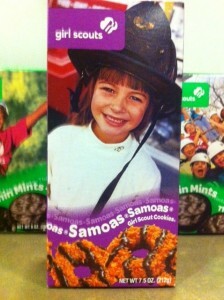 We will try to determine which cookie on top out of the three top sellers: Samoas, Thin Mints and Tagalongs. Samoas are doughnut shaped cookies that are a mixture of caramel and coconut and have a glaze of chocolate on the outside. Taste: 5/5: Chewy yet tangy, not for people who do not like coconut. Size 4/5 : The hole in the center leaves precious cookie left out. Appearance 5/5 :looks delicately made with the shredded coconut and glazed chocolate. Thin Mints are the most popular girl scout cookie and are recognized throughout as the top dog. They are round mint-flavored cookies combined with a dark chocolate coating. Taste 4/5: Simple but effective, powerful mint tasting cookie. Size 3/5: Cookie is surprisingly small, size could be increased a bit. Appearance 4/5: Dark chocolate coating compliments the green of the box quite well. Tagalongs are round cookies that are also coated in chocolate, inside is a layer of peanut butter. Taste 4/5: Sweet and chewy is always a combination for success, the Girl Scouts get just that with this cookie. Size 4/5: Fatter than the Thin Mint and also does not possess any holes, maximum cookie surface area! Appearance 3/5: Kind of dull and unimaginative, not much to the Tagalong compared to the stylish Samoa. Results: The judging shows that Samoas come out on top according to our results. Although Thin Mints may be the most popular, the true quality lays with the Samoas. Remember that all the proceeds of these cookies go to a good cause and you really cannot go wrong with any of them.